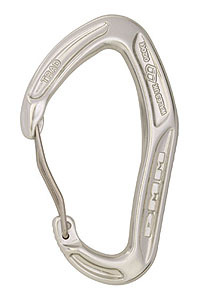 Alpha Trad excels in Summer and Winter, from cragging to expeditions and everything in between. 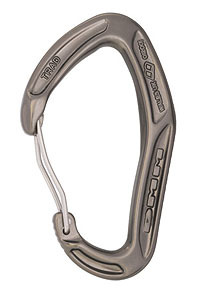 The hot forged ergonomic back combines with the clean nose wire gate to provide an easy clipping, fumble-free, anti-snag biner. I-Beam construction combines deeper rope basket,e asy to handle, grippy shape, generous 8.5mm rope radius, and reduced gate snagging. Hot forging allows manufacture of more radical shapes and details - like the bump inside the bottom basket that serves to guide the rope towards the corner and away from the gate opening. Bearing radiuses can also be similarly enlarged and are more rope and runner friendly. Sport, multi-pitch trad or super alpine climbers. Available with 11 mm Dynatec Quickdraw Slings - to hold the anodized bottom biner steady while you make the clip and also prevent the carabiner from cross-loading when loaded. Color andodized adds smart looks and extra corrosion resistance.